Local teams cook up their best crawfish at the Hospice Foundation of the South's 2018 Crawfish Cook-off at Fritchie Park in Slidell. 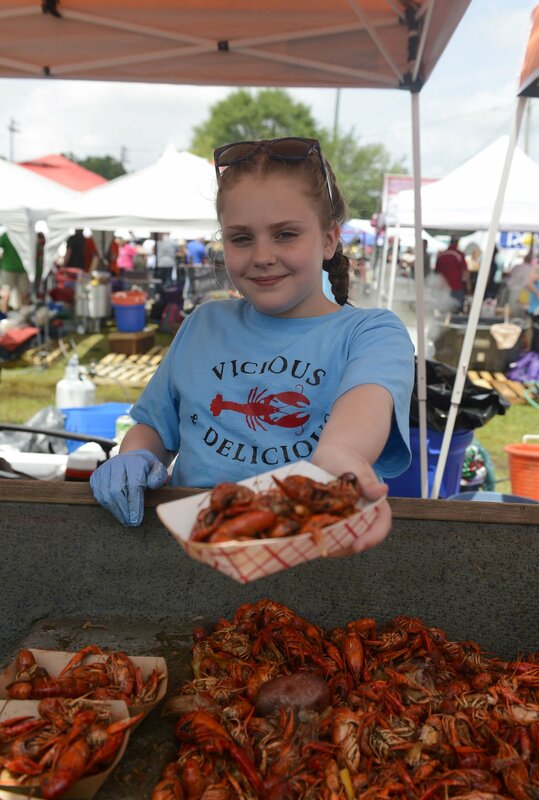 Mallory Doll, 11, with the team Vicious and Delicious, hands out crawfish during the 2018 Crawfish Cook-off at Fritchie Park in Slidell. The oldest is Hospice Foundation of the South’s annual crawfish cook-off, which last year drew more than 7,500 people to Fritchie Park in Slidell. The 16th annual Crawfish Cookoff for Hospice will be held from 11 a.m. to 6 p.m. Saturday, April 27, at Fritchie Park, 905 W. Howze Beach Road in Slidell. Tickets are $30 in advance and $35 at the gate. Children 12 and under get in free. More than 40,000 pounds of crawfish will be boiled and served, with cash prizes for the top three teams and best decorations. Live entertainment will include Dana Dufrene and the Velvet Kick, the Bucktown All-Stars and Supercharger. Beverages and other food are available for purchase. “It’s our ‘Spicy 16,’ ” said Hospice Foundation’s Executive Director Miranda Parker. The cook-off now raises more than half of the foundation's yearly operating budget. Toyota of Slidell will be defending its title against more than 50 teams vying to have their mudbugs named Best Crawfish in St. Tammany Parish. Many of the teams return year after year. Tickets are available at www.crawfishtickets.com or at any St. Tammany Parish Whitney Bank. For information, email MirandaParker@thehospicehouse.org, visit thehospicehouse.org or call (985) 643-5470. St. Paul's Alumni Association’s 10th annual Crawfish Cook-Off will be held from 1 p.m. to 6 p.m. Saturday, April 13, on Saint Paul's campus at 917 S. Jahncke Ave. in Covington. The event is held in conjunction with alumni reunion weekend. Tickets are $30 for adults, $20 for youths 13-18 and $5 for children 7-12. The cook-off will benefit Hope House of St. Tammany, as well as Saint Paul's High School and the Alumni Association. Hope House’s mission is to provide justice, hope and healing for abused children. For information, contact Al Nastasi at aln@stpauls.com. The ninth annual Crawfish Cookin' For a Cause will be held from 11 a.m. to 5 p.m. Saturday, April 27, on the Mandeville Lakefront. There will be live music by Typically Booked and Mike Epstein. General admission is $25. Crawfish Cookin' for a Cause supports local families affected by catastrophic illness. This year's recipients are Cure Juvenile Myositis Foundation, which works to find a cure and better treatments for those affected by the autoimmune system disease; Project Red Light for Hope, which helps the family of Beth Crutcher Giacone, a Covington native who has suffered with ALS (Lou Gehrig's disease) since her son was 2 years old; and Grant's Gift Foundation, which provides a network of resources to improve the lives of individuals with special needs, with a primary focus on underprivileged and disabled children. The fifth annual Crawfish and Roses will be held from 11 a.m. to 6 p.m. Saturday, May 4, at the Abita Brewing Co., 166 Barbee Road in Covington. Early-bird tickets are $25, $30 at the door. Children 10 and under enter and eat free. Rain date is May 5. Tickets are available at Eventbrite.com or call (985) 845-7121. All proceeds are split between The Miracle League and The UP21 Foundation for families affected by Down syndrome. The musical lineup includes the Last Chance Bluegrass Band, Bulletproof and Katie Kenney in the beer garden. There will be a silent auction and viewing of the 114th running of the Kentucky Derby at 5:50 p.m.
Celebrity judges include Super Bowl 44 champion and former New Orleans Saints player Jeff Charleston, a sports performance coach who is a regular cast member in Bravo TV’s "Southern Charm New Orleans." St. Paul's Alumni Association Crawfish Cook-Off: 1 p.m. to 6 p.m. April 13, at the school, 917 S. Jahncke Ave., Covington. $30 adults, $20 for ages 13-18 and $5 ages 7-12. Crawfish Cookoff for Hospice: 11 a.m. to 6 p.m. April 27, Fritchie Park, 905 W. Howze Beach Road, Slidell. $30 in advance; $35 at the gate. Kids 12 and under get in free.